Rotating crops from corn to soybeans in regular intervals helps boost yields for both crops. For some, that means two years of corn and one of soybeans. For others, it means switching every year. 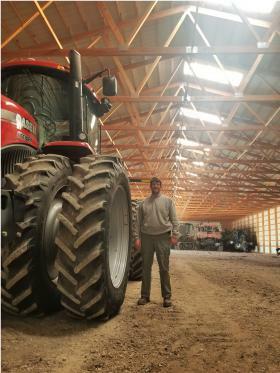 For crop farmers, winter is the offseason. But that doesn’t mean they take the winter off. It’s meeting season — going to endless seminars or having discussions about better ways to farm — and planning season. Planning may seem like it would be a challenge given the trade uncertainties, including the tariff war with China. 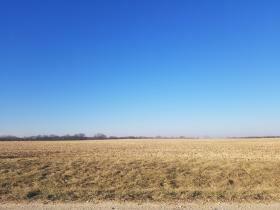 Harvest Public Media's Madelyn Beck reports that farmers have to plan for the spring, no matter the uncertainty. That conflict has cost farmers billions in lost trade opportunities, especially affecting soybean farmers. Early estimates showed signs of a record soy crop in 2018, piles of which are now glutting the market. However, farmers’ plans may not change because farmers they can’t afford to alter the course. Most of agronomist Stephanie Porter’s clients even bought their seeds by mid-December. “The earlier they usually buy their seed, they can get discounts. So a lot of them have already made that decision,” said Porter, an agronomist with Golden Harvest. Corn brings in more money for farmers at the moment, but it also costs more to grow (due to fertilizer and seed prices), she said. And some farmers rely on a crop rotation because it helps increase crop yields, which is important when farmers’ bottom lines have been tight the last two to three years. Every dollar earned on an acre counts. “I’d say 90 percent of our acres are pretty well fixed what we’re going to do, year in, year out,” said Strom, who also is the president of the Knox County Farm Bureau. Farmers make decisions based on what they know works, especially when they can’t influence outside factors like trade or Mother Nature. “You never know when you’re going to have a 2012-type drought situation or 1993-type flooding situation. So you can’t really plan for those types of things. But doing the best you can with the information you got and the more information you can collect, the better off you are,” he said. Strom’s sticking with corn and soybeans for the 2019 growing season, even though he acknowledged there is still a “burdensome supply” of soybeans and continued trade uncertainties. China did buy some soybeans from the U.S. late last year after discussions between President Donald Trump and Chinese President Xi Jinping, but the amount was less than 5 percent than what China had bought in 2017. As of Jan. 7, there was no formal trade deal for the upcoming season. As more trade news comes out, ag lenders like Mike Shane will certainly be watching. 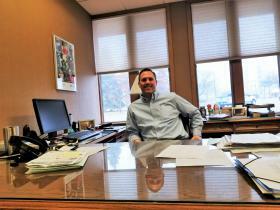 Shane is the vice president of agricultural banking at F&M Bank In Galesburg, Illinois. He takes things like crop prices and markets when he works with farmers, but also considers farmers’ specific operations. That relationship is key when times get tough, as it allows farmers open up about their problems and bankers to provide direction on purchases and loans. Essentially, he said, he doesn’t want to give too big of a loan if a farmer is in a bad situation and can’t make the payments, especially with increasing interest costs for loans. “That shocked me. And these are strong farmers who are deciding to do that. And so that to me just says that, you know, guys are watching and they are watching every penny, and it’s not just on the big-picture items. They’re looking down to the real minimal things, too,” Shane said. This reflects how the last few years of low crop prices have weighed on farmers, but Shane said there’s good news: Crop yields, at least in western Illinois, were up in 2018. Plus, federal bailout money kept some above water. The Trump administration announced in August that it would spend up to $12 billion to stem the effects of the tariff war. About $9.6 billion of that is direct payments to farmers, with the majority reserved for soybean growers. “I think that payment was the difference between people making money and not making money this year,” Shane said. But the government shutdown that started on Dec. 24 has delayed both rounds of payments. And Agriculture Secretary Sonny Perdue has said the U.S. Department of Agriculture won’t extend that federal aid into 2019 if the trade war continues into the coming growing season. This story has been corrected to show that all producers, not just soybean producers, would be getting direct payments from the $9.6 billion in federal bailout funds.